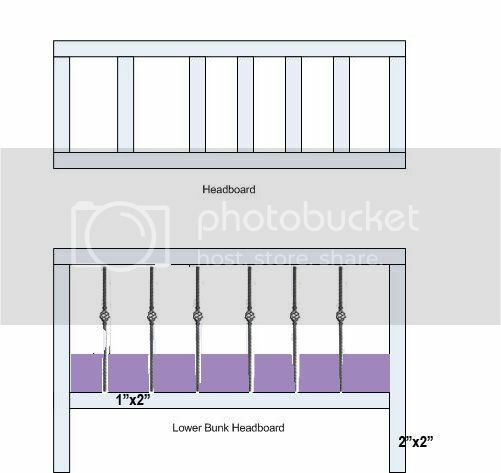 My wife is looking for some low L shaped bunk beds for our daughters room. I was looking on line for different designs and was originally thinking a wood working project. Now I am thinking a combination wood/metal project. I'm trolling for some ideas (I'm not the most creative). What material would you use? My girls are 4 and 6 and are of course into girly stuff (barbies, etc). If I come up with something cool, I also have 2 boys in a room who could use bunk beds as well. I was thinking about some sort of metal frame that would be smaller than a typical wood structure as they have small rooms. I am a hobby welder with a nice mig and access to tig. Any thoughts or ideas out there? The first thing I would do is get the measurements of the mattresses you're planning on using. That would give you what you have to have to make it work for more than just one set of kiddos. The next thing I would do is to set down with your wife and lay out some parameters that she wants and or needs. I know. Most guys don't want to have that conversation but take it from me. Believe it or not women are on the average smarter than guys when it comes to designing things that are practical. I can't explain it except for our hammer reflex I guess. The other thing is if she buys into it then chances are you won't be asked to build another one, right this time, anytime soon. I like the idea of using sixteen gauge galvanized fence tube for the frame work if you can find a muffler shop close by that has dies for 1 5/8". It's substantial enough in size and appearance, easily welded if you're careful, ventilate, ventilate. And it can take a powder coat that will outlast mild steel by years. Powder coating cost is down to where it's foolish to paint anymore. Not sure how small the room is but we have a small room also and I just made a Loft to hold 2 beds end to end. You can see the Old single bed underneath but that is now at a friends house. Anyhoo- I just kept it simple- they're going to draw on it and cover it in stickers so why waste my time and fancy usually gets $$ quickly. Nice bunk and pictures. I can't fit both beds back to back so I think I am going to do an L. One bed up and one bed down. I saw some cool ideas on the projects gallery. Any thoughts on a combination of wood and metal? I hate to say I don't have much creativity. If I was using mostly square tube, what dimensions would you use? Any sites I can use to figure out what materials sizes will hold a given load? 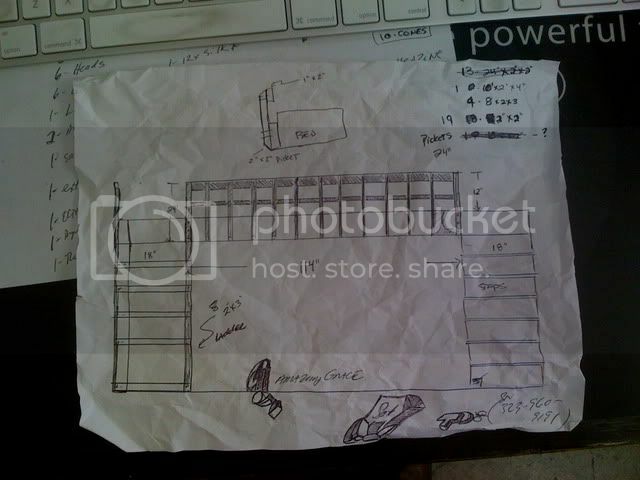 For the legs I would use 2"x2" 16g iffin metal and then some 1/8" angle for the bed support. Wood- you could use 2x4's but you'll need to sand the crap out of them or run them through a planer and then just do the decorative metal work for the end pieces and canopy- if you go that route. Creativity on comes from a whole lotta trial and error. 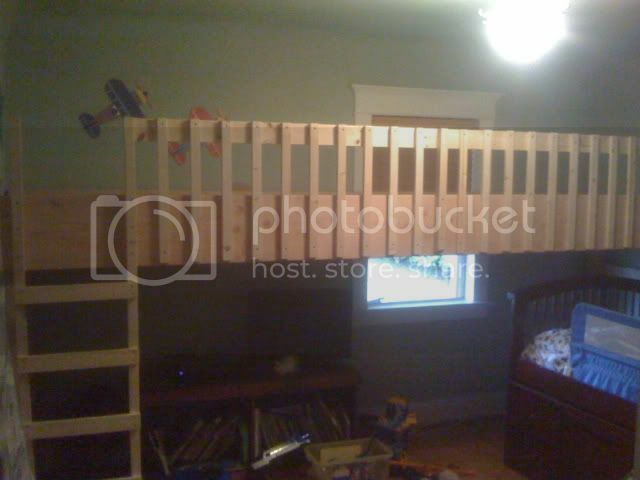 One of the most interesting projects I ever built was a trundle bed for my son when he was about 3 years old (he turns 29 tomorrow, by the way). I built it out of walnut from a blown down tree on my property. I had it sawn and planed. You will have a fun project that the kids will treasure for years. 2 things I would tell you. 1. buy the mattress, measure it (they vary a little), and allow enough room to easily make the bed (probably 2 inches). Mine was always a little tight by the time you have 2 sheets, blanket, and spread. 2. really think about how it will go together and break down later. I used standard rail hooks and you need the pins to be pretty precise to lock properly. I would suggest just using some bolts for the rails instead. Wood, metal, or wood and metal together - all could make a nice design. Go to the furniture stores with a camera and tape measure. You will find some great ideas to start your design. Be sure to post some pictures of the project's progress. I tried making a some basic designs here. 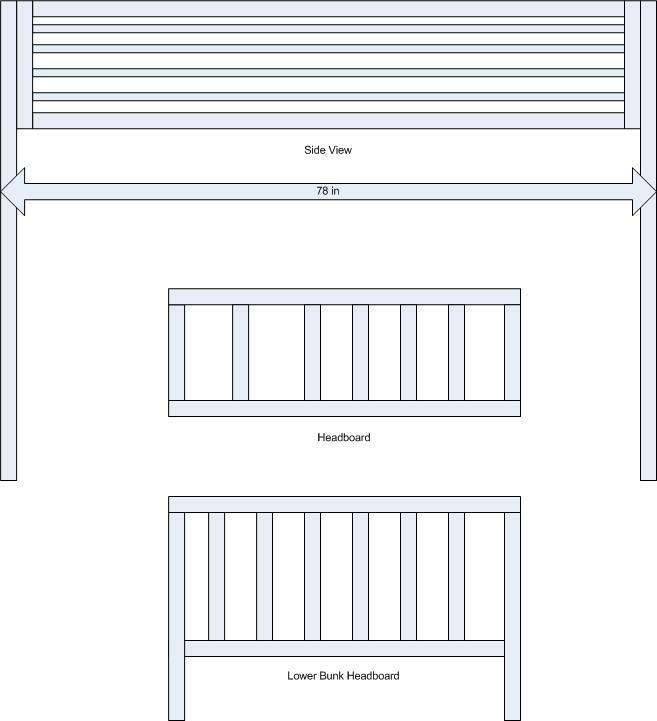 The main frame would be square tube and I was planning on getting some woven baskets from King Metals for the head board and foot board. I was originally thinking of using 2x2 .065" tube for the main uprights and frame, but am wondering if that is overkill. Can I use 1x1 instead? What wall thickness should I be using. I am not an engineer and certainly don't want this to collapse on my kids, but don't want it too heavy as well. This will be a low bunk with a total height of 60". Suggestions welcome. Since it's been a couple years since your post, I'm sure you've probably come up with something by now. My son and I recently built folding bunk beds in a playroom. All framing was welded from 2x2-3/16. The bed frames were made to match standard twin size mattresses. Pivot points are at 1/3 the width of the head/foot. 5/8" bolts in sleeves with lock nuts are used for pivots. There's a 7/8" washer between bed frames and support frames for clearance. The nylon lock nuts allow for precise tension for opening and closing. Stop tabs keep the beds either exactly horizontal or exactly vertical (a nut welded to the wall support stop tabs allow for precise adjustment for horizontal). The first wall support was plumbed and lag screwed to horizontal framing already in the wall. Once the bed frames are temporarily bolted to the wall support frames, the second wall support was lag screwed to the wall. Angle iron feet were welded to the outer wall support uprights so that concrete wedge anchors could secure the outside legs to the ground. Toggle clamps keep the bed frames from opening or closing, unless released. We cut aluminum tread plate to fit inside the 2x2 angle iron of the bed frames and then ¾” oak plywood was placed on top for a solid base. 1” screws through the bed frame then hold the tread plate and plywood in place. Mattresses are held in place with buckled straps 6” from each end of each mattress. Brooke, how do you gain access to the top bunks? Looks like you could construct a ladder on the framing between them that could be used for each one. Here's one I built a few years ago.